Technic: Original etching/engraving on a verge type handlaid paper. Condition: Very good, given age. Original folds from binding with some paper separation at lower fold all backed and restored. General age-related light toning and minimal staining from handling. Some creasing. Paper edges a bit irregular as issued and with ocassional chipping. Please study scan carefully. Description: Original antique map, titled 'Succession des Empereurs du Japon avec une Description de Meurtre de l'Empereur Cubo et la Reception des Ambassadeurs Hollandois en ce Pays la'. It shows: a central table of the succession of Japanese Emperors, a map of (part of modern-day) Japan, and two engravings: the death of Cubo, and the Dutch ambassador's arrival in Japan. The 2 engravings derived from Montanus: the murder of Emperor Cubo in a rebellion in 1564 and the arrival of Dutch Ambassadors in Japan 1644. 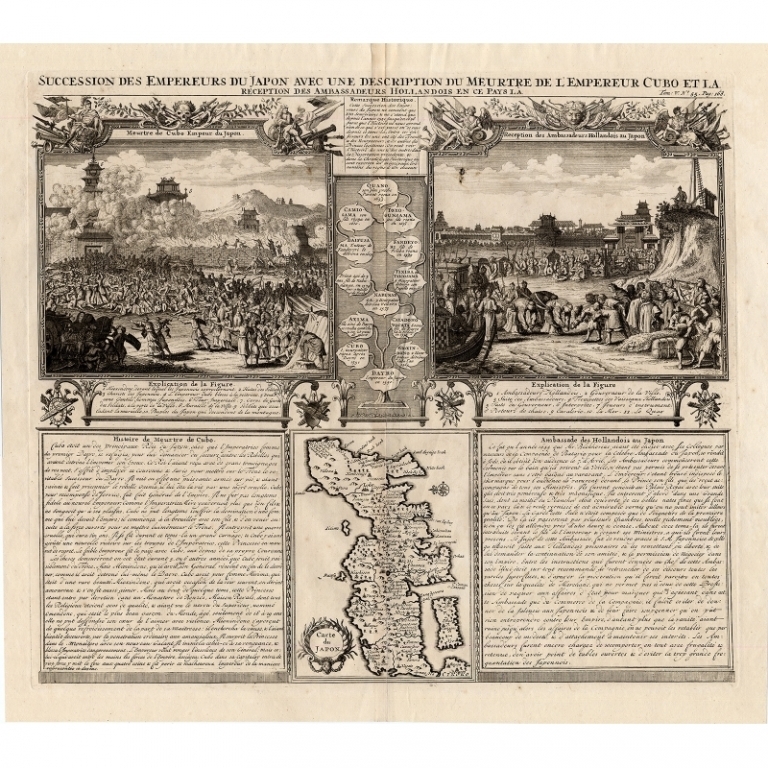 This original old antique print / plate originates from the fifth volume of: 'Atlas Historique...' (Historic Atlas...), Published by Zacharie Chatelain, Amsterdam, 1732. The atlas was published in seven volumes between 1705 and 1720, with a second edition appearing in 1732. The maps were accompanied by information pertaining to cosmography, geography, history, chronology, genealogy, topography, heraldry, and costumes of the world. The maps in the Atlas Historique were mainly based on those of the French cartographer, Guillaume De L'Isle, but were presented by the Chatelains in an encyclopaedic form. We do not know the exact edition of this map. 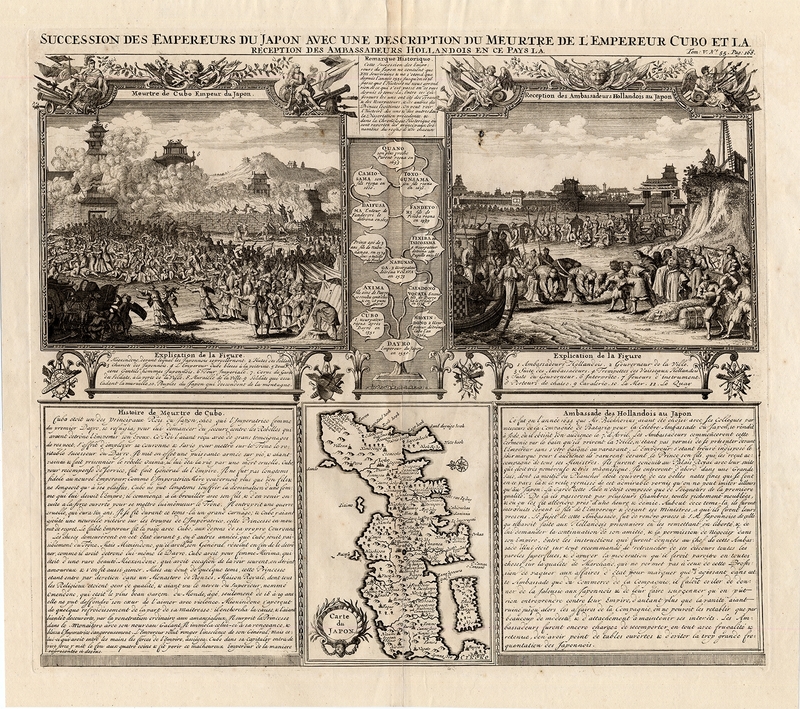 Artists and Engravers: Henri Abraham Chatelain (1684-1743), his father Zacharie Chatelain (d.1723) and Zacharie Junior (1690-1754), worked as a partnership publishing the Atlas Historique, Ou Nouvelle Introduction A L'Histoire under several different Chatelain imprints, depending on the Chatelain family partnerships at the time of publication.